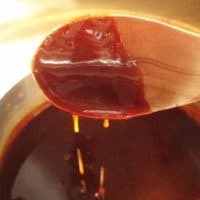 Homemade Caramel Sauce Recipe | Good. Food. Stories. Please don’t call me a stupid girl, but science was never my favorite subject in high school. Despite childhood obsessions with dinosaurs, the NASA space program, and the process of mummification (yes, they did remove the brains through the nose with knitting-needle-style hooks), my interest in becoming a real archaeologist or physicist faded once I had to memorize more than the behavior of protons, neutrons, and electrons. So imagine my surprise when I discovered that making caramel, a highly scientific process, is one of my favorite kitchen party tricks. Caramel is basically two ingredients: sugar mixed with cream. Sounds so simple, right? But there’s a clever chemistry that makes the business a bit trickier than you’d think, and here’s why. Though it looks dry to the naked eye, granulated table sugar is actually classified as a wet ingredient—it’s a molecule called sucrose (formed of equal parts glucose and fructose, just like those tricky protons and neutrons!) that dissolves fully in water. Problem is, this particular molecule has a danger zone. As the sucrose heats up and prepares to break down into glucose and fructose (aka become a sweet, glorious syrup), it has a tendency to re-crystallize into really hard chunks. If this happens, game over: those glucose and fructose bits are bonded like superglue and you’ll never get them to unbind. You’ll sometimes hear people talking about the caramel “seizing up”—this is what they’re talking about. So while you could make caramel sauce by simply melting sugar on its own in a pan or throwing in a tablespoon or two of water to help the process of dissolution into syrup, I use the extra insurance policy known as light corn syrup to help mitigate potential crystallization. Note that light corn syrup is not the same thing as the dreaded high fructose corn syrup, which has been chemically converted to fructose (think about the bad process of hydrogenating oils). Light corn syrup is pure glucose, which tips the balance of the solution and makes it pretty much impossible for the constituent parts to re-bind. You’ll have smooth and pourable sailing by adding it to the mix. Watch the video below to see the process of turning sugar into caramel and then try it yourself—and FYI, because sugar is so water soluble, you don’t need to worry about scrubbing the pan when you’re done. Just soak it in water and the caramel will virtually disappear as it cools. Caramel sauce, the classic dessert that mixes sugar and cream, can be made without the caramel seizing if you add one ingredient: light corn syrup. Pour the water and corn syrup into a heavy-bottomed saucepan, stir in the sugar with a wooden spoon, and place over medium heat. It will have the consistency of wet sand. Keep a careful eye on it as the temperature rises. As the sugar heats, it may crystallize slightly but also begin to melt. Don’t stir; instead, swirl the pan to incorporate the ingredients as the sugar liquefies. Keep swirling. As the sugar fully dissolves, it will deepen in color, moving from golden to a deep amber and start to smell distinctly amazing. 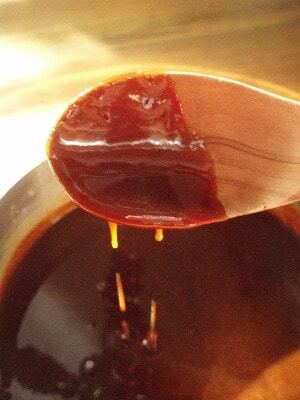 Be careful: the liquid will bubble up as the cold cream hits the molten sugar, so make sure your pot is large enough not to overflow.The caramel may seize and harden; if this happens, place the pan back over low heat and keep whisking until the caramel re-melts. As a final decadent touch, add the butter to make the sauce even richer. Allow to cool at least 15 minutes before serving. Related: Make your own vanilla ice cream.